Are you an office worker who was injured while at work in Brooklyn? Injured office workers may be entitled to financial recovery beyond their workers’ compensation benefits. Depending on the party responsible for the injury, an injured office worker may be able to file a third-party claim to recover additional compensation. This recovery includes compensation for long-term medical care and emotional suffering in addition to lost wages and medical expenses. 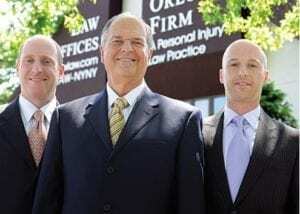 The injury attorneys of The Orlow Firm have experience representing office workers and other injured employees in Brooklyn, Brooklyn, Brooklyn and Manhattan and throughout New York. We have handled numerous third-party claims, and we know how to achieve a fair outcome on your behalf. When you work with our firm, you will speak directly with a partner. You should always expect that of a law firm you hire for your injuries. Have you been injured in an accident at the office? Call our law firm toll free at (646) 647-3398 to speak with a personal injury lawyer as soon as possible. You may also contact us online. Many injured office workers are aware that they are eligible for workers’ compensation benefits and that they generally cannot sue their employer directly for a workplace accident. But they may not be aware that in some cases, they may be able to hold a third party responsible for their injuries. Our law firm can refer you to a qualified workers’ compensation attorney if you have been injured in an accident at work. We can also represent you in any third-party claims for damages. We believe that all injured people should receive quality legal representation, no matter how financially well-off they are. That is why we take all cases on a contingent fee basis. If you decide to hire us as your law firm, you will not owe any attorney fees unless we recover money for you. If you or a loved one was injured at work and would like more information on filing a third-party claim, please contact our Brooklyn personal injury lawyers to schedule a free consultation. We offer free initial consultations and have four offices across New York City for your convenience.